Estus Soup are healing stations you encounter along your travels, where you can stop to drink from a cauldron to heal your HP. 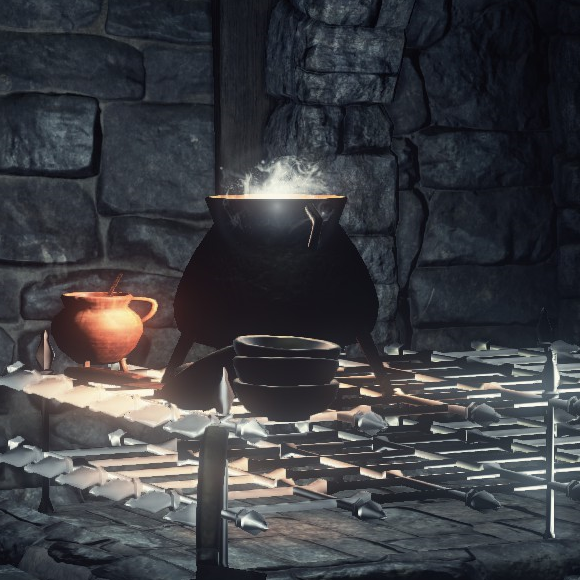 A prompt will appear near each cauldron with the option to "Drink Estus Soup". Undead Settlement, behind a locked door in the house past the open area with the big tree. Drop down through a hole in the floor above. Farron Keep, near the Keep Ruins bonfire, on a small island in the swamp past the ladder. Irithyll of the Boreal Valley, near the Distant Manor bonfire, in the kitchen past the sewer entrance. Siegward of Catarina is the one that cooked the Estus soup. Once you enter the Irithyll kitchen and have done his quest line correctly, he ask that you have dinner with him and tell you of the fine estus soup he makes..
I&apos;m curious why aren&apos;t there any Estus Soups after Irythyll. I mean, I know that it may be only "testing new mechanics" part of the game, but I hope there will be place for another soup, at least in the Ringed City DLC. This should be changed. The soup doesn&apos;t fill your FP, only your HP. can you fill up your flasks too? Has anyone found any lore that ties this soup to the Warriors of Sunlight? The one in Undead Settlement is in the covenant room and the one in the swamp by the Wolf bonfire is right next to a lootable Sunlight Medal. it would be pretty neat if the soups refilled your estus&apos;(esese) by 1 or so... oh well.. praise the hope! Theres another one in the Irithyll sewers.